Sometimes it is needed to make control assignments only to specific Elements within the AWM2 PART (or to specific Operators within the FM-X PART). In the default setting the control assignments are valid for all Elements of a Performance. The individual assignments for Elements can be done on the Controller Set screen - you can select the Element for Destinations that allow individual selection. This means that all used control settings made in the Part Controller Set are initially enabled. If you select a parameter that allows for individual Element assignment, you must OPT OUT for the individual Element. The default is that an ELEMENT is set to OPT IN. In other words, if you select a parameter Destination that does offer individual ELEMENT assignment, the Elements are initially set to active (ON) by default. If you don't want to control an Element turn its individual Switch OFF. Of course, if you do not select the parameter Destination, its being ON or OFF is of no consequence, because you will not be changing anything. For better understanding it may help to compare this function with the corresponding function of MOTIF XF, which is the "Element Switch" in the Controller Set Assignment. As you can see in the displayed screenshot, the Effect parameters are unchecked or greyed out, because they cannot be used individually for Elements. This is because of the selected Destination. The entire sound (all Elements together) are routed through the selected destination (Effect). "InsA-HSH G" (Insert A - High frequency Shelving Gain) which is an EQ parameter and "Reverb send" are situations where the entire program is processed, it is not a possibility to select just a single Element. In CONTROLLER SET 4 and 6 (Destinations "cutoff" and "AEG release", respectively) are checked for all Elements. Here you have a choice, and all Elements are opting in. In CONTROLLER SET 3 (Destination "Element Level") is checked only for Element 8. The programmer would have had to uncheck Elements 1-7 in order to OPT OUT. A CONTROL SET on the Motif XF consists of a SOURCE (physical control) and a DESTINATION (target parameter). The DEPTH dealt with the application of the controller both range and direction, and for those Destinations appropriate you were provided the option to select specific Elements individually. 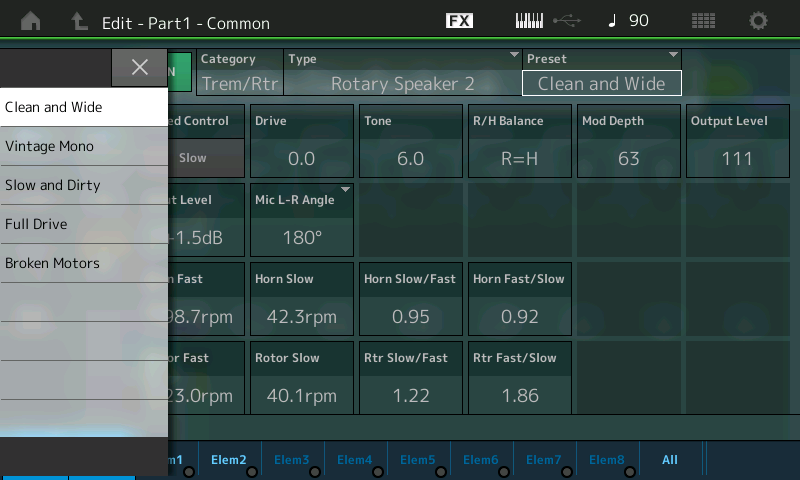 The MOTIF XF had only 6 Control Sets; MODX provides 16 Control Sets per PART and an additional 16 for the COMMON/Audio level of editing; plus new parameters like Curve Type and Polarity and advanced shaping tools designed so you can customize the application of controllers. These new shaping tools exponentially increase the DEPTH function as was available in the Motif and MOXF series. DEPTH does not have to be linearly applied. In fact, you can completely customize the shape of how the application of a controller is applied. You can manually apply it or automate its application. This is at the core of the Motion Control Synthesis Engine. The layout is a bit different. But the operation is fundamentally the same. If you want to make individual Element assignments you have to edit the Controller Box Switch matrix. Translation: CONTROL ASSIGNMENTS are easy to deal with because they are seen within the PART's Element/Operator view and are made as you think about them - which is intuitive. It is very much like patching a modular synth, in that as you build your sound, you make the necessary connections/assignments. The key thing here is the Destination (parameter) determines whether or not the Element/Operator Switches appear or not. Obviously, some Destination parameters are PART destinations (affect all Elements or Operators together like common Volume, Send to Reverb and Variation, etc.) and others are individually switched per Element or Operator (like Element Level, Element Pan, AEG, FEG and PEG parameters, Cutoff, Resonance, LFO etc.). Think about all the individual envelopes you can control within the 8 PARTS, each with as many as 8 Elements (if AWM2) or each with 8 Operators (if FM-X). Instead of the organ sound occupying a Part, here each B3 (Tone Wheel) Organ sound is a single Element within the same Part. Element 1 Gospel is assigned to the right (fully clockwise) position, Element 2 1st Four Draw is set to the left position of the Super Knob. In the center position you will hear a mix of both. First step, for the Super Knob assign is the assignments in the "Common/Audio" Controller Box: The first two Knobs (Assign1 and Assign2) are set to link with PART 1 on this upper Common/Audio level (the Super Knob level). Instead of morphing between PARTS, we are now working within a single PART by manipulating individual Elements (since this is an AWM2 sample based program). Each Element references a Waveform. A Waveform organizes a set of samples mapped to respond across the keyboard at specific pitches and velocities. COMMON (blue) > Select "Control" > " Control Assign. Next follow the assignments in the Part Controller Box, which is basically the same as morphing between Parts, but this time using the Element Level as destination. Below, we can take a look at the two PART 1 destinations. Ensure that "Auto Select" is active (green). This Performance is a Single Part and only two Elements. It should be noted here that, you can STORE the position of the Super Knob with the PERFORMANCE. If you want this Performance to come up with the 1st Four Draw Element alone, you would store the Super Knob at a value of 0. If you wanted the Gospel Element alone, you would store the Super Knob at a value of 127. And finally if you wanted to recall the sound with both set equally, you would store the Super Knob at 64, or the balance you desire. Touch "Motion Control" in the main screen's left column. SUPER KNOB value is in the upper right corner. This is a good example to illustrate how easy it is with MODX to assign a parameter (Destination) to a controller (Source). While up until now, we have been going through the screens where this all takes place on the "scuba diving" tour. The following is a quick and easy assignment – for the “snorkelers”. Say you've selected the Rotary Speaker TYPE as Insert Effect "A" and you want to assign Rotary Speaker: “Speed Control” to the MOD WHEEL. (Notice this Performance does not have it assigned). Touch "Effect" in the left column. This is where you can assign the Effect Types to the INSERTION A and B blocks. Touch "INS A" to view the parameters of the Rotary Speaker. Press the [CONTROL ASSIGN] button (located to the left of the screen below the Super Knob), which is now illuminated. This button will glow when you have placed the highlight on an assignable parameter. Done! It takes you immediately to the Controller Assign screen where you can tweak the Controller response (Depth) and/or Delete the assignment (Lower right corner of this Control Set screen). Notice that the Element Switches do not appear as they are unavailable - because all Elements will be affected by the application of the Rotary Speaker Speed change. The [CONTROL ASSIGN] button, located to the lower left of the screen below the Super Knob, will glow whenever you move the cursor highlight to a potential assignable parameter. This allows you to rapidly assign, then scale and shape the application of that controller. Catch up on the previous article in the series - "Mastering MODX: Assignable Knobs” here. Check out the next article in the series: "Mastering MODX: Side Chain Modulation" here.